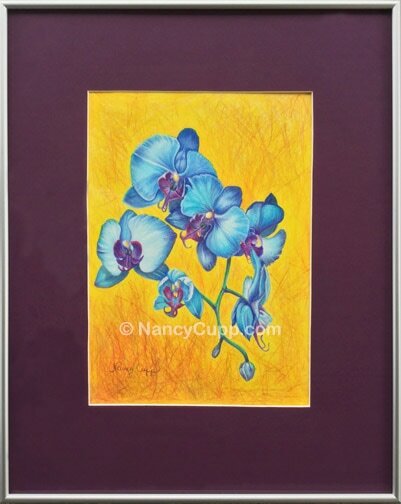 These were real living blue orchids that I used as the model for this painting. I’d never seen blue orchids before and just had to have them. They were the inspiration for several paintings I did. This was the first one I did. I asked my husband what to call it, and being the romantic poet that he isn’t, he suggested Blue Orchid #1. I couldn’t think of anything better, so voila! The study of color is really fascinating. Can you imagine living in a world without color? What if the world was just one color, or no color at all? The only way you could distinguish between one object and another would be through value changes from light to dark. When God created the universe, the first thing he did was turn on the lights. I can just imagine God walking into his dark workshop or art studio and turning on the lights before he began to create to His heart’s desire. The Bible says he didn’t create the Sun or stars until the fourth day of creation. So where did the light come from? As the most powerful energy source anywhere, His light was from within. As we learned in science, white light is the presence of all colors. Darkness is the absence of light and color. Jesus said he was the light of the world, therefore every color shows a different aspect of His glory. The Blues speak of God’s living water that cleanses and brings life to all that drink from Him. The river of God cleanses, restores, and brings us peace. The whites speak of righteousness and purity. The purples speak of royalty, power of authority, steadfast love, and discernment to get rid of impurities and replace it with God’s provision and love. The yellows are the oil of the Holy Spirit, mixed with reds, Jesus blood, turning to gold, refined in holy fire, bringing us to the heavenly realm of heaven where even the streets are lined in gold. Let the colors and beauty of the flowers remind you of God’s love for you. You are beloved!